I deal with a number of companies only available via Interior Designers- not your High Street shops. Artistry in Iron is one such company. 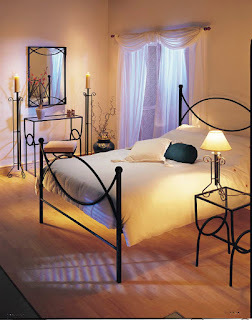 You will find their range of furniture in almost every showhome in England. You don't need much of it, but what you do have is Quality. This range is available in White, Black, Silver or Nickel finish. Bedroom Furniture is a new trend that has been getting increasingly popular.Furniture play great roll to decorate our home.Our company is also provide modern Indian Furniture for living room.Explore more about Indian Furniture at here.